Someone recently had a case of auction purchase regret. Before the Raptor there was the Lighting. 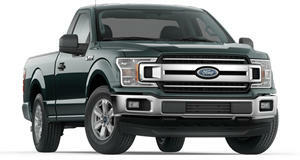 Though both are Ford F-150 variants, they had completely different attitudes and purposes. One is an extreme off-roader while the other pushes the limits on-pavement. Both are incredibly good at what they do. Of course, Ford built more than one F-150 Lighting generation, but there was one concept in particular that never made production. We wish it had. Ford unveiled its F-150 Lightning Rod concept 18 years ago this month at the Chicago Auto Show. It was essentially a chopped, stretched, and lowered F-150 with hot rod inspiration. The so-called tattoos inside and out were reportedly inspired by New Zealand’s Maori natives. Even the tires have a tread tattoo. The exterior, without question, is all hot rod. "Lightning Rod draws from the passion of the muscle cars of the 1960s, the hot-rod industry, and the current body art craze to take America’s bestselling pickup to a new level of performance excitement,” Ford’s now-former North American design chief, Ed Golden, said in a 2001 press release. It’s easy to see that influence. The roof has been chopped and lowered by an inch, and the lowered body rides on a set of 20-inch custom five-spoke wheels. Even the front and rear overhangs were shortened while the front and rear bumpers were integrated into the body. We also really dig its neon tube-like headlight styling. Under the hood lies a supercharged 5.4-liter V8 with 380 hp and 450 lb-ft of torque. This also happened to be the same engine Ford used in the production F-15 SVT Lightning at the time, though that truck had far more conventional styling. However, and this is important to know, this engine is not Department of Transportation or EPA certified. And that potentially makes it a hard sell. Yes, it’s for sale on Craigslist in Phoenix, Arizona. The seller doesn’t hide the fact that it’s not street legal, and is looking for a car collector to snap it up. 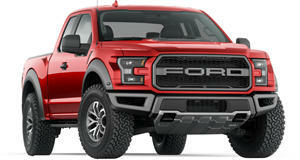 What’s interesting is that as far we know Ford built only one example, which makes sense given that it’s a concept. We did some quick digging and discovered the truck was auctioned off last month at Barrett-Jackson’s annual Scottsdale event for $27,500. Heck, we even wrote about last November ahead of the auction. Apparently, there’s some buyer regret, or the guy simply needs some quick cash. It’s being sold for $27,000, nearly the same as what it was purchased for. Even the auction’s ‘SOLD’ sticker remains attached to the windshield. Although the concept truck runs and even has seat belts (which are just for show), there’s really no point in buying unless you’re fine just staring at it or driving it around your private land.